Even with increasingly bellicose threats from Iran, most experts don't expect the price of oil to spike dramatically. NEW YORK (CNNMoney) -- Despite the uptick in oil prices thanks to Iran's threats last week, experts don't foresee a major oil price spike even as evidence mounts that tougher oil sanctions against the country are beginning to bite. 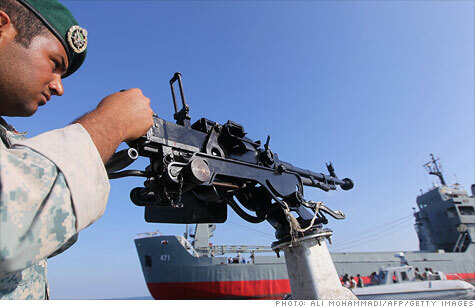 Crude prices have risen about 2% since Iran vowed to shut down the Strait of Hormuz last week. About a sixth of the world's oil production passes through the Strait. It is believed that Iran's posturing is the result of ever tightening sanctions as Iran spars with the West over its nuclear program. Iran says its nuclear intentions are peaceful, but many experts suspect they are designed to produce weapons. On Wednesday the noose around Iran's economy tightened further. Reports said Europe may be close to enacting an outright oil embargo on Iran. About 15% of Iran's oil exports go to Europe. The European news comes after President Obama sanctioned Iran's central bank last month in an attempt to restrict Iran's oil exports and a similar, stronger move from England. The West is walking a fine line with Iran, hoping to squeeze its vital oil export business enough so the country's regime curtails its nuclear ambitions but not enough to cause oil prices to spike. Refineries in Japan, which buy a big chunk of Iran's oil, are said to be talking with the Saudis about getting oil from there instead, according to Addison Armstrong, head of market research at Tradition Energy. In China, which is the largest buyer of Iranian crude, Iranian oil shipments have dropped significantly in the last two months, said Fariborz Ghadar, a senior adviser at the Center for Strategic and International Studies. "We know the Chinese aren't using any less oil," said Ghadar. "So someone must have stepped in." That someone is also most likely the Saudis. Not on particularly friendly terms with Iran to begin with, Saudi Arabia technically has enough spare production capacity to make up for all of Iran's 2.2 million barrels a day in oil exports. And that's what experts hope will keep the price of oil in check. "There's not going to be much of an impact if the Saudis and others are willing to jack up production," said Ghadar. "I don't think it will be as great as some people think," he said. "That oil can easily be replaced by Saudi Arabia or rising exports from Libya." While the embargo isn't affecting the price of oil, it is having an effect on Iran. Oil exports account for half of the Iranian government's revenues, so even a small drop in exports can have a big impact. Last week, partly as a result of the sanctions on Iran's central bank, there was a run on many of the country's banks and the national currency dropped 40%, said Ghadar. Inside the country, prices are rising as the currency falls. "People are complaining very loudly," said Ghadar. "This is the first time sanctions have been effective." As for Iran's threats to close the Strait, experts say they are just bluster. Armstrong notes that Iran is completely dependent on seaborne exports and imports for its entire economy. Shutting down the Strait would be economic suicide. Ghadar pointed out that even at its narrowest point the Strait is still 21 miles wide and Iran's navy is no match for the United States. Still, with so much military hardware in the region and the stakes being so high, the potential exists for a miscalculation on either side which could turn this standoff into an outright war. If that happens, even if the Strait is closed for an hour, some traders say oil prices would see an initial spike of at least 50%.